Glenn Irwin at the Sunflower Trophy races on Saturday. British Superbike frontrunner Glenn Irwin will donate £4,000 to the family of William Dunlop following his success at the Sunflower Trophy races on Saturday. Irwin rode the B.E. 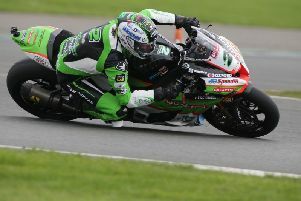 Racing Kawasaki to victory in both Supertwin races at the County Down circuit, winning £400 in prize-money. He matched the amount himself, while the 28-year-old’s loyal sponsors also pledged £400 each to boost the overall amount, totalling £4,000. The money will go to William’s partner, Janine, daughter Ella and new-born baby Willa. The Ballymoney road racing star was tragically killed during practice at the Skerries 100 in July.